We told you earlier this week about Schemata Workshop’sprogress toward creating a multifamily cohousing development at the site of their 12th Ave headquarters. Friday morning, they’ll be out helping to push another project forward — your bicycling commute to work. 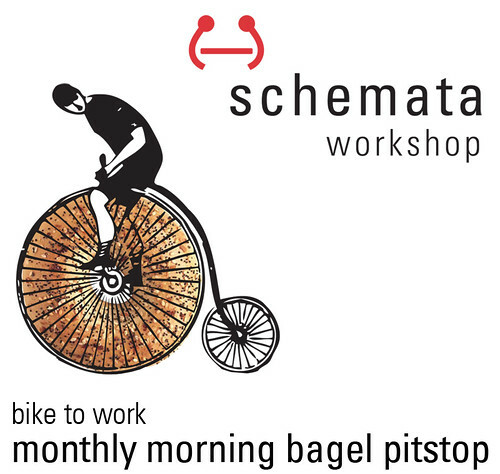 Schemata teamed up with Eltana Bagels for a Bike to Work Day station back in May and have decided to keep the team work going. Pedal by Friday and say hey. But be careful around those traffic circles on the side streets, eh? Last month Schemata hosted a small Bike to Work Day DIY Commute Station. It was a simple setup – just a table, some bagels, and some smiles. We visited with many friends and neighbors on their way to work or school on 12th Ave. In fact, it was so fun that we’ve decided to host a monthly bike-to-work bagel pit-stop at our office on the last Friday of the month during the summer! We’ll be set up with a table in front of our office at 1720 12th ave next Friday the 29th from 7:00 AM to 8:30 AM. Stop by for a bagel and a chat! Schemata is a CHS content partner, by the way.